For the modernization of a wastewater treatment plant near Auckland, innovative Direct Pipe technology was used to install a sea outfall pipeline. 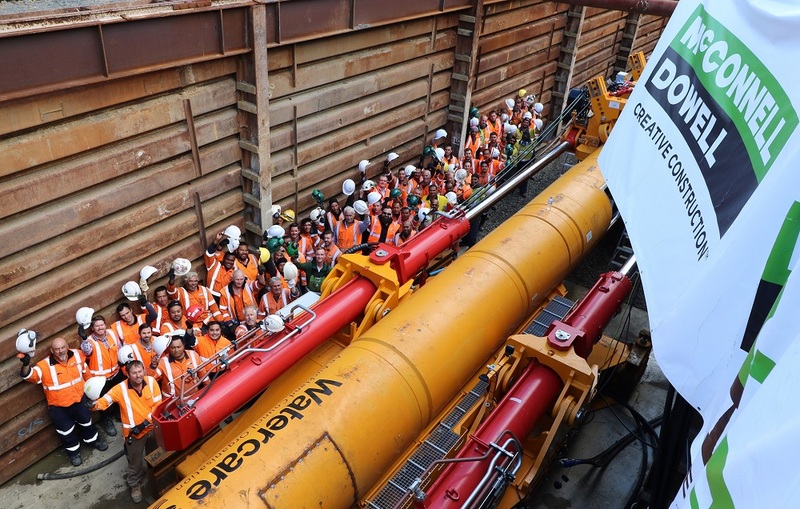 The machine bored its way over 1,930 m through the New Zealand subsoil into the sea, breaking a new world record. Every year, around 380 km of new pipelines are installed worldwide using Herrenknecht technology. Thanks to innovative technology developments such as Direct Pipe, pipelines can be installed quickly and securely even in difficult topographies. Crossing under a hurricane protection levee in Texas, Direct Pipe met even the stringent safety requirements of the US Army Corps of Engineers. The method combines the advantages of microtunneling and HDD technology. In a single step, a prefabricated pipeline can be installed trenchlessly and the required borehole excavated at the same time. In Auckland, for example, Direct Pipe proved itself in the modernization of a wastewater treatment plant. Here the Herrenknecht machine set a new distance record: it bored 1,930 m through the New Zealand subsoil into the sea. By using the innovative technology, harmful environmental effects on the underwater flora were minimized. The company also offers HDD expertise for pipeline installations like this from the mainland to the seabed (shore approach). In Anglesea, Australia, the Dunstans Construction Group replaced the sea outfall pipe of a water treatment plant cut off by a collapsing cliff using a Herrenknecht HK250C rig within a few months. HDD rigs from Herrenknecht are part of contractors’ standard repertoire for river crossings too. In South Paris, as part of a canal extension, the 10-m deep Canal latéral à l’Oise running parallel to the river Oise was widened and deepened to accommodate large vessels. The existing gas pipeline had to be lowered by 8 meters and replaced. After only a week, the approximately 250-m long and 18-m deep river crossing was successfully completed. A special feature of this project: the HK80CK rig used is hybrid and powered by both a diesel engine and an electric motor. Once the rig is in position, only the electric motor runs during the drilling process, resulting in lower exhaust emissions. In urban areas in particular, the compact rig stands out with its space-saving design, while its low noise levels can increase acceptance of construction work among the population. Mechanized excavation technology is also used for the extraction of resources. With entry angles between a shallow 8 and a vertical 90 degrees, coal seam gases and oil sands at depths of up to 2,000 m can be tapped using Slant Directional Drilling (SDD). In Zevenbergen in the Netherlands, renewable geothermal energy accessed by Herrenknecht deep drilling rigs is used to heat multiple greenhouses. The principle is simple: a well raises the warm water from a depth of 1,535 m. Then, after the heat has been extracted, the cold water is pumped down a second well back into the reservoir. To drive advances in the pipeline market, Herrenknecht is constantly working to improve existing pipeline technologies. In close cooperation with HDD specialists, for example, innovative tools have been developed that greatly simplify the previously multi-stage reaming process. The Full Face Hole Opener (FFHO) is a milestone in HDD pipeline installation as it enables the efficient reaming of pilot holes in a single step. The Downhole Jetpump (DHJP) removes the drill cuttings in the drill string itself and not through the borehole. This means HDD boreholes are cleaned much more effectively and safely than before. The tools can be used individually or in combination to help to get the best results from any project. With around 80 subsidiaries and associated companies working in related fields worldwide, Herrenknecht provides comprehensive fast and targeted services close to each project and contractor. In late 2018, a new HDD service hub opened in Houston, Texas, right in the heart of the American pipeline business. The U.S. state is the world’s sixth largest oil producer. With its location, the company is now even closer to the center of the U.S. oil industry.